I have been on a bread baking storm lately and no, before you ask, I didn't discover how to squeeze in an extra 3 hours into the day or anything. What I have discovered are the joys of no-knead bread, which literally comes together in just minutes, sits out to rise for a couple of hands-free hours and bakes, leaving you with not only the delightfulness of homemade bread and a great smelling house but because it's all so easy, that winning feeling of somehow unbelievably, getting something for nothing!! 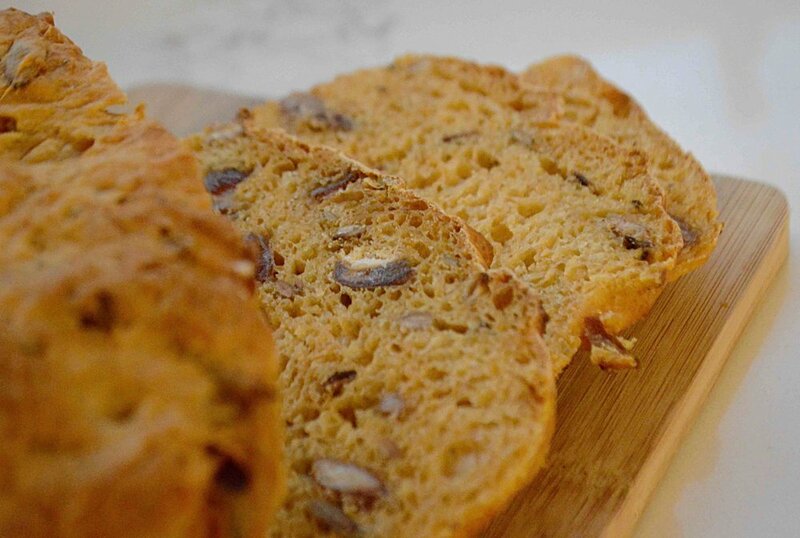 Today it's a seasonal favorite with a lovely orange hue and lots of chewiness and crunch. Just in time for the orangey-ness of Halloween! 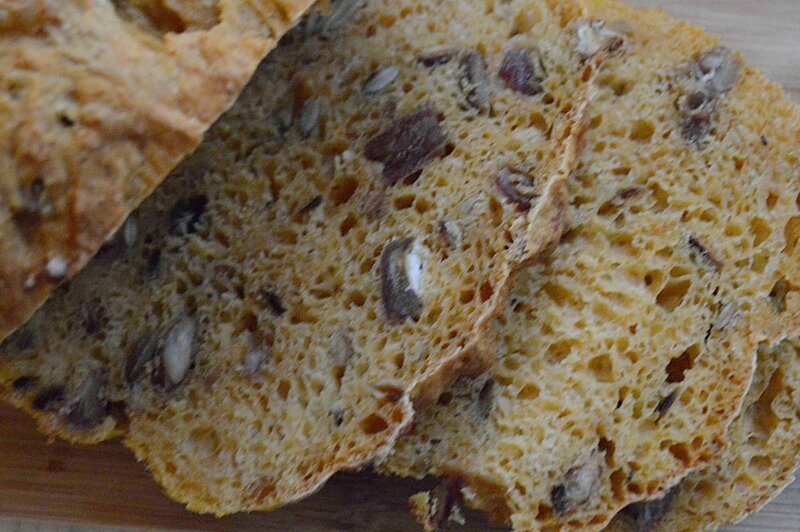 I know most everyone is probably obsessed with costumes and candy today but I'm thinking that a batch of this bread and a pot of some homemade soup, maybe this one, would be a great pre-or post trick-or-treating meal--healthy, delicious and just right for chilled bodies!! If you get a jump on it today, you'll be all ready for the onslaught of tomorrow. And if not, this would be a great addition to any Thanksgiving celebrations--just a few of my helpful hints! Plus, it's another way to sneak a little more pumpkin into your life. Ever since my discovery several years ago that what I hated was not the actual flavor of pumpkin, but the allspice that generally accompanies it, I have been searching for different ways to use the big "P". And this gorgeous bread does not disappoint. It's hearty without being heavy and filled with the wonderful combo of sweet dates and crunchy toasted pecans and pumpkin seeds. Perfect as is or toasted. And no preservatives. When you bake it yourself, you control exactly what's going in! Feels like it should come from an artisanal bakery and yet it's straight out of your own kitchen!! 1. 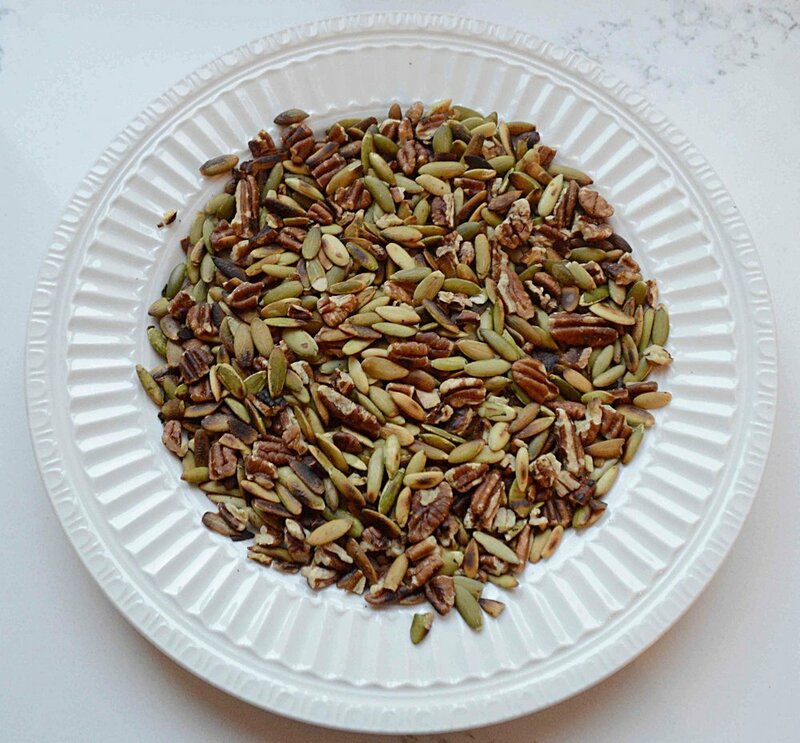 Toast the pumpkin seeds and pecans in a skillet over medium heat for about 5 minutes, stirring often, until golden. Set aside to cool. 2. Place the pumpkin purée, honey and boiling water in a medium bowl. Stir well to combine and then let sit for about 20 minutes until lukewarm. 3. Place the flour, salt and yeast into a large bowl and whisk together. Add in the cooled seeds and nuts and the dates and whisk together. Then pour in the lukewarm pumpkin mixture and use a rubber spatula to combine the ingredients into a ball of dough. Cover with a damp kitchen towel and leave in a warm spot for 1 ½ to 2 hours, until doubled in bulk. 4. Preheat oven to 375ºf and make sure rack is centered in the oven. Generously butter two 1-quart oven safe bowls with the softened butter. Use two forks to deflate the dough by pulling it towards you from the outside, rotating the bowl in quarter turns so you're left with a rough ball of dough. Now use your forks to make a dividing line down the center of the ball and using the forks as pincers, transfer each half to the prepared bowls. Leave the bowls on the counter uncovered for about 20 minutes or so, until the dough rises again to the edges of the rims of the bowls. 5. Bake the dough for 35-45 minutes, until the breads look golden brown, Remove from the oven and turn out onto wire racks to finish cooling completely. Bread can be stored, well wrapped at room temperature for 3-4 days or in the fridge for longer and is great toasted. Note: Recipe adapted from Bread Toast Crumbs by Alexandra Stafford. I left out the sunflower seeds, doubled the pumpkin seeds and increased the amount of dates too.